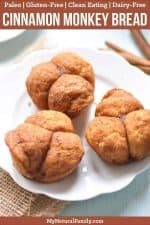 This Paleo Monkey Bread is perfect for Christmas breakfast or brunch, or any other special occasional brunch. I hope you like how they have a bit of sweetness, without being overly sweet. When I was in college I had awesome roommates, like seriously awesome! One of my roommates used to make us pull apart monkey bread, and I was pretty sure she had completed my life. It was so good! She said that it is what her mom would make their family on Christmas morning, and I could see why – it was insanely delicious. I have never made the monkey bread myself. I don’t have the recipe, and I have never been that ambitious…but I have never forgotten it, like I said it completed my life :). In fact, I was going down memory lane the other day. (Just a side note, when I was about 3 years old the name of the street we lived on was Memory Lane. Our apartment building was right next to a cemetery. I think that name was very appropriate, don’t you?) 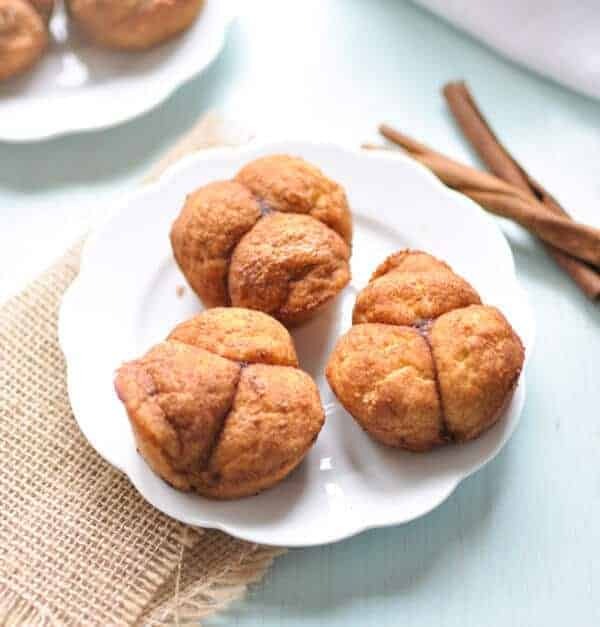 Which made me think about that bread..so I decided I would make my own healthier and simpler version, and that is how this Paleo Monkey Bread, aka cinnamon clover rolls came to be. Wow! I am so glad I was ambitious enough to come up with this recipe, because they are GOOD! They are only lightly sweetened, instead of dripping in sweetness, like the life completing college bread – BUT I am ok with that, and actually prefer the lightly sweetened version. Uh, what? (yes, you heard that right, I prefer a little less sugar for this particular recipe :). These rolls are also grain, nut, and gluten-free, being made with high-fiber coconut flour, and surprisingly have a very similar taste and texture to original bread. Plus, they are super-simple to make, and require no rising, yeast, or any of those other complicated ingredients or steps. These provide the best results when served warm out of the oven. If you have leftovers, place them in an airtight container and store in the refrigerator for 1-2 days, and warm before eating…BUT seriously, they are the tastiest right out of the oven. There is just something special about making a homemade, special breakfast or brunch on Christmas morning that is a really special tradition. Part of it is the smell of the cinnamon and the warmth of the sugar that brings everyone together around the table to talk excitedly about their presents. It can also be a good time of year to reflect on the real reason for the season and finally sit back and relax a little after all the hustling about and getting ready for the big day. I do recommend you make these once or twice before you plan to make them for your family though, so you will feel fully relaxed and have the recipe down before cooking for everyone. Besides, that just gives you an excuse to eat these a few extra times . . .
9 Paleo Breakfast for Kids Recipes They Will Beg You to Make! 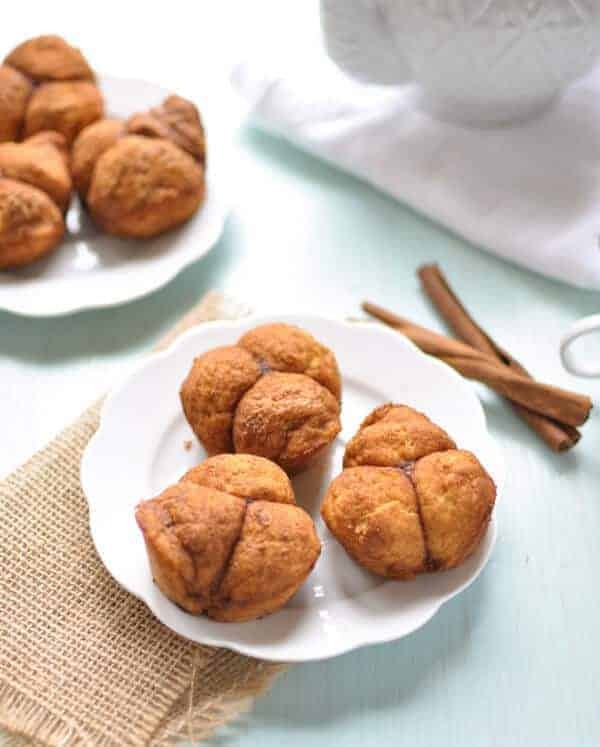 This Paleo monkey bread are the perfect cinnamon sugar clover rolls for a sweet breakfast or brunch. I love how they are a little sweet, but not too sweet – but oh, so comforting! Thank you for creating such a delicious recipe. Easy to make and I enjoyed your straight forward prep instructions. Keep up the great work — I look forward to visiting your blog often. I’m so glad you like the recipe and the instructions. I hope you find other good recipes and come back often. I have never seen little rolls shaped like this before! They are super cute and I bet taste delicious too.. a recipe I need to try!